The Terceira Mastiff usually had a light brown, fawn, or tan short and smooth coat with a slightly darker color around their face. 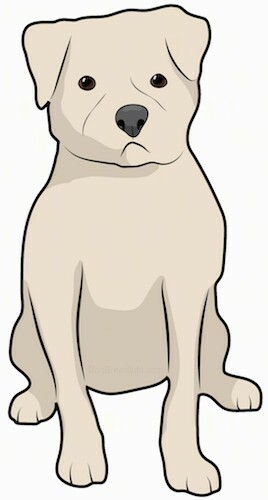 They could also have had brindle, black, or red coats although these were often considered to be a mixed breed instead of a pure Terceira Mastiff. Their tail was short and curled around itself like a corkscrew, which was one of their most well known features. 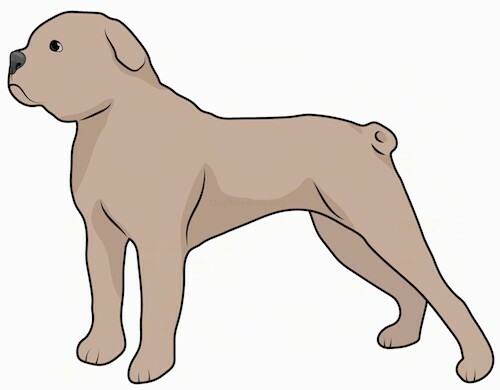 Like most molosser breeds, they were muscular and had a slightly wider chest, a thick neck, and strong legs. They had shorter ears which laid on the sides of their large head. This Terceira Mastiff was known to be suspicious of strangers and often they were dog aggressive since many were trained and picked for dog fighting. There are no records of whether the Terceira Mastiff had health issues although they were probably similar to other Mastiff breeds. This may have included things such as hip dysplasia, bloating, or strained joints and muscles. There are few records of this breed although the Terceira Mastiff probably would have been fine in a small home or apartment as long as they were walked regularly. There are no records of how much exercise the Terceira Mastiff needed although most molosser breeds were lower energy and only required a daily walk. There are no records of how long the Terceira Mastiff lived although when comparing the related breeds, they could have lived anywhere between 8–12 years. There are no records of this breeds litter size although they could have had litters anywhere between 4–10 puppies. Since the Terceira Mastiff had a short smooth coat, they only needed to be brushed occasionally and bathed only when necessary. The Terceira Mastiff was developed in Azores within the Terceira Isles and had many ancestors from local dogs in that area. These ancestors are dogs such as the Bulldog, Dogue de Bordeaux, Bloodhound, and both the English and Spanish Bulldog. Pirates were quite fond of the Terceira Mastiff and they soon became popular as a fighting dog. In the 1880’s there were attempts by Dr. Jose Leite Pacheco to make the Terceira Mastiff a standard within the FCI (Fédération Cynologique Internationale which means World Canine Organisation) using Rabo Torto as the official breed name which means “twisted tail” or “curled tail”, but it was never approved because this dog breed was already endangered by this time. This dog was on the edge of extinction all the way through the 1900’s until in 1960 the Portuguese government made attempts at saving the breed. Unfortunately, there were misunderstandings between the breeders of the Terceira Mastiff and the government so this plan was not a success. By the 1970’s the only people with this breed were farmers and high end dog breeders local to the Terceira Isles. It is said that the last people left with this dog breed attempted to recreate the breed themselves, but nothing was confirmed.